You are here: Home / Healthy Diet / Health Supplements, Vitamins & Minerals / Vital 3 Review: Does Supplement Work in [April 2019]? 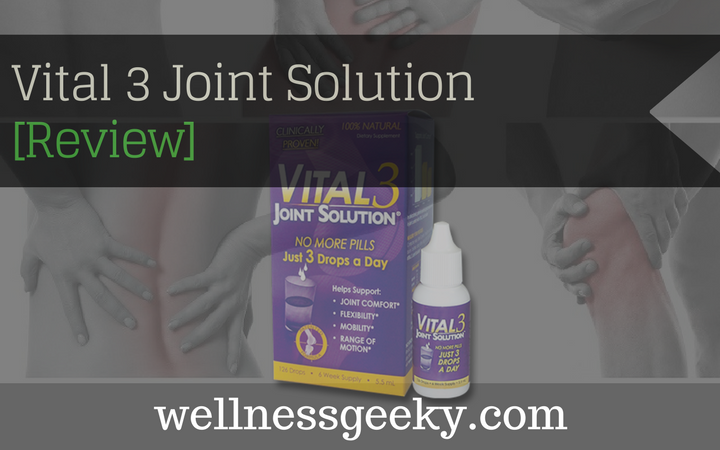 Vital 3 Joint Solution is a natural dietary supplement that is made and marketed as alleviating joint pain. Said to increase mobility and flexibility as well as improve joint comfort, it's designed to work with your body's natural joint health system to improve and maintain, or trigger, comfort. Vital 3 trains an immune system to help improve the health of your joints. This is opposed to other supplements like glucosamine or chondroitin, which are supposed to work by adding an ingredient that helps your joints. There are many questions surrounding the efficacy of Vital 3. We dug into the research and reviews to find out and compile this Vital 3 review. Think of how Vital 3 works the way you think about bodybuilding. Just like a bodybuilder gets bigger muscles and grows gradually, so it is with Vital 3 feeding our joints with what they need to support themselves and get healthier. It's designed to enable your body to build up its own healthy joints over time by feeding it the proper nutrients. It's not a quick fix. As we get older, our joints naturally degrade due to normal wear and tear, natural inflammation, and the loss of lubrication. That's why joints feel sort of dry and achy. They're losing natural moisture which lubricates them. It replaces what our bodies lose in the aging process so that gradually they'll have what they need to support themselves and maintain strength and health. If you're wondering exactly what's in it that enables to support the body to maintain healthy joints, it's collagen. Vital 3 is comprised predominantly of a collagen type II-n1 solution (a structural protein in cartilage and ligaments), which is what most of our connective tissue is naturally made out of. Collagen runs throughout our bodies and helps to keep the structural integrity of tendons, joints, and ligaments intact. Other than that, it's just distilled water and diluted acetic acid. Many supplements suffer from a common by-product when it comes to whether or not they work and about the safety of taking it. The human body is complicated, and everyone is different. Some things work for some and not for others, and unfortunately, there's scant scientific evidence to understand why. This is why so often the reviews and results of the same product are often mixed. While Vital 3 is no exception when it comes to documented outcomes, one thing it has on its side is research. It is actually clinically proven to work. If you look solely at the research done in the trials, the facts point to yes, the supplement works. If you read the reviews and literature from people who have tried it for themselves, the results are mixed. At about 60 percent positive and 40 percent negative, the outcome once again is mixed. Many people report a great experience and that their joints are pain-free, and they have better comfort, flexibility, and flexibility. A little less than half of the people who review the product, however, say they saw no results. So, the pattern follows those of most joint supplements. For reasons science can't explain, it works for some and not for others. If you suffer from joint pain, there's no silver bullet, but it is probably worth trying. It comes in liquid form and includes a dropper. This makes it easy to take and administer, and there are no unwieldy pills to swallow. You get a one-year warranty, so if it doesn’t work for you, you can return it for a full refund. It’s safe and has no known side effects. It’s easy to add to any liquid or a beverage of choice. It reduces joint pain for some people. It has no effects on many who have tried it. It doesn’t contain glucosamine or chondroitin, which many feel it should or at the very least would complement. The company even says it might be more effective for you if you add it to your daily routine that already includes taking glucosamine and chondroitin. As stated, the written and video reviews are wholly mixed. For those for whom it works, they sing its praises. Many say they are walking again pain-free and that it's changed their lives. Many reports it is a lifesaver. For those who love it, they say they are recommending it to all of their friends. For the other end of the spectrum, however, the recurring complaints are that it is a waste of money because it doesn't work. Many simply reported no results and experienced no pain relief. Many reviewers claim to have better results with glucosamine. So, when all is said and done, you're probably wondering if it's worth trying. After researching the ingredients, reading all the research, and digging into customer reviews and complaints, we've concluded that if you suffer from joint pain, it's worth trying. This is a legitimate product and is not a scam in any way. They have a money-back guarantee. They've conducted clinical trials and have found that it works. The upshot is that supplements are a roll of the dice by nature. You might lucky - it might work. And if you're not, you won't suffer any ill side effects and can get a refund. We think it's a worth a try, as it has worked for many. All supplements come with the possibility of being the thing that changed your life or the product that didn't do anything. Unfortunately, there are simply no guarantees one way or the other. Hope you made your own decision by reading our Vital 3 Joint Solution review on this page. If you suffer from joint pain, Vital 3 is a worthy prospect, and might end up being just the supplement that strengthens your joints, improves joint pain and gets you back to living your active, normal life again. As far as where to buy, you can pick up a bottle or three at your favorite local drug store, Walmart, or on Amazon.